SHOULD RUSSIA ALWAYS BE GUILTY AS CHARGED? Johnny Blue Star wonders why certain elements of the mainstream media in preparing for the Trump-Putin summit wanted to short-circuit the chief criteria in establishing guilt in democratic countries? In watching the MSNBC and CNN prequels to the U.S.-Russian summit, I was amazed at how they continue to assume the guilt automatically of anyone accused of wrongdoing by our intelligence agencies. In the case of the special prosecutor's indictment of the 12 Russian military intelligence officers, the continuing conclusion of reporters and analysts in their media organizations was that these officers did this crime- and it was at the behest of Putin. I have two problems with this. One, did we need Vladimir Putin to remind us (as he did to a reporter) that it was up to a court to decide guilt or innocence of defendants? And that was right after Putin invited Mueller's team to come over and join in the interrogation of those officers (if a Russian team could reciprocally go over to the U.S. to investigate a criminal case they are interested in). My second reason is that their constant harping on Putin's guilt reminds me of their neglect in reporting the US two Syrian strikes (which occurred without the correct approval of Congress) and the expulsion of 80 Russian diplomats following the poisoning of the ex-spy and his daughter without a real investigation. These strike me as "jumping the gun" when those very accusations and their actions look more like wanting to use the gun- against Russia. The amount of attacking Russia by CNN and MSNBC on this and other issues is overwhelming. For instance, the United States has interfered with many different elections in similar ways to the Russians. Why are these news networks so eager to forget our often tragic interference? They speak as if our country is so innocent and their constant haranguing on Russia's actions in the situation of Crimea, advancing the notion that we and the rest of NATO are so eager to spread Western democracy to other countries and protect them with NATO's firepower. The fact is we are more likely advancing empire-building for ourselves and our allies than spreading actual democracy. In fact, democracy is on a swift retreat in our country. 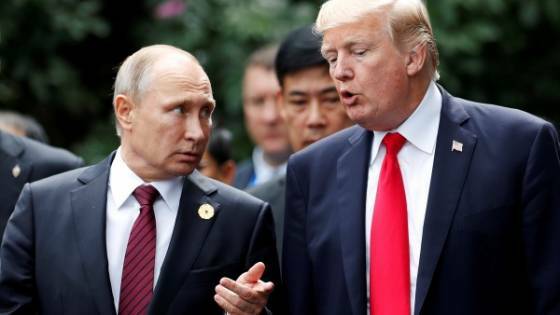 And Putin is certainly right when two countries like ours exist that could conceivably destroy the planet, it is better to talk and come together just like Trump suggested. And it is almost horrifying to see the two cable networks push the anti-Russia agenda based on a "you are guilty until proven innocent" scenario. It is more than dangerous.